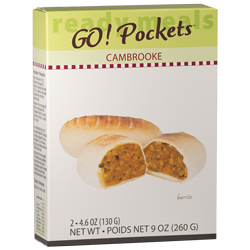 Description: Each package contains 2 - 130 g sandwich pockets that are filled with a blend of Mexican - inspired savory spiced filling with a hint of chipotle and bell peppers wrapped in a crusty, tender dough - to GO! Quick from package to the plate, just heat and serve for a delicious snack or tasty meal. Micro-wave crisping sleeves included.